of the new Stay at Home Daughters! A survey for Homeschooled girls ages 17-32! We're still working on the new Stay at Home Daughters, but in the meantime I wanted to pass this along to our readers! Today is Tuesday Talks here at Stay-At-Home Daughters. 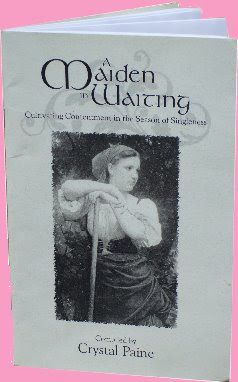 I am reviewing "A Maiden In Waiting", compiled by Crystal Paine. This booklet is really good. Basically, it is filled with articles and testimonies from young women just like us, sharing what they are learning in their single years about contentment. I really enjoyed reading this. I know you will too! With all the hullaballoo about the new vice presidential candidate, stay-at-home daughter Jasmine Baucham shares "Ten Reasons why I Don't Want to Be VP." I thought you would be delighted and encouraged by this post, so I'm linking you to it! As a woman who hopes someday to be a wife and mother, I want to give my household 100%; not 80% for the nation, 20% for my household; not 50% for the nation, 50% for my household; not 90% for my household and 10% for the nation; I want to give everything I can to the home I have been called by God Almighty to guard (Titus 2:3-5), to the family He may make me the mother of. While on the issue of Sarah Palin, these are very much worth reading, from some of my very favorite bloggers. McCain's Biblically Unqualified VP Pick a "Feminist for Life"
Hi, I had a question for you guys. If you could give me some insight, I would really appreciate it. I am the only SAHD in my church. How might I balance keeping my beliefs and opinions to myself to not offend, and being honest and giving folks a different perspective outside of the college/career path? I don't know what sort of sympathies you have in your church, but any insight you might have would be helpful. Thanks, Bethany T.
I'm going to share a little bit of encouragement for Bethany, then I'd like our readers to chime in with whatever they feel appropriate! First of all, Bethany, I know just how you feel. There are quite a few stay-at-home daughters in my church, but I know many others who are not at all understanding about my current position. When you are living your life to the glory of God, you are going to have people look at you funny now and then. If not, then you are doing something wrong. I take comfort in that daily! Don't worry about offending others. Live your life the way the Lord leads you! As long as you are displaying a gentle and quiet spirit, the Lord will take care of the hearts those around you in his perfect will. When asked about your situation, or your convictions, explain in the politest way possible, answering every question with as much insight as you think will best benefit the inquirer. Don't get into a confrontation - if someone is getting pushy or trying to sway you, let your father (or mother) handle it. Most of the time, this will not happen. I usually have people get very quiet or try to change the subject. Simply modeling a biblical worldview and a gentle and quiet spirit will show others that you are different from the average college aged girl. Most people who ask will have a genuine interest in your beliefs and why you do what you do - even if they are not likeminded. Trust the Lord, Bethany, model your beliefs in your behavior and answer other's questions politely. Don't be afraid to offend others. Let them be offended if they wish - you're not telling them what they have to do with their life, you're simply living as the Lord leads you. I hope this answers your question! If you have any extra, or more specific questions feel free to comment! Readers, please chime in with your thoughts on this matter, I'm sure you can be much more eloquent and helpful than I can!